Star Oilco has a simple and effective approach designed to empower you to easily manage your fuel cards. Cardlock and secure fleet cards have been around since the 1970’s and oddly enough, our competitors fail to field them properly. Star Oilco is here to help and would like to give you some simple and efficient practices to eliminate fuel slippage. By attaching the fuel cards to the vehicle and not the human being, you immediately break the driver’s belief that the company is providing fuel to them and not the company vehicle. That’s why we recommend you attach the fleet card to the vehicle key chain and NOT in a driver’s wallet. For additional security, employ a Corporate Fleet Card that is secured by a PIN. Star Oilco recommends either Pacific Pride or CFN, both of which are in the Fuelman Network. Star Oilco will provide you with a keychain designed to hold up to two fleet cards. Use a “Floating PIN” system where every member of the team has a secret PIN that is only to be used by them. We recommend attaching fuel cards to the vehicle key chain and having each driver use their own secret PIN to purchase fuel. With this secret PIN, Star Oilco’s Fuel Cards track their name with every fuel purchase. Their name will appear next to the transaction on the bill and on an E-Receipt confirming who bought what, when, and where. This personalizes all fuel usage. Many companies already have a secret PIN policy around time cards and clocking in and out of work. This Best Practice stacks well with that. Implement and enforce a “No Tolerance Fuel Theft Policy” that every employee must sign. 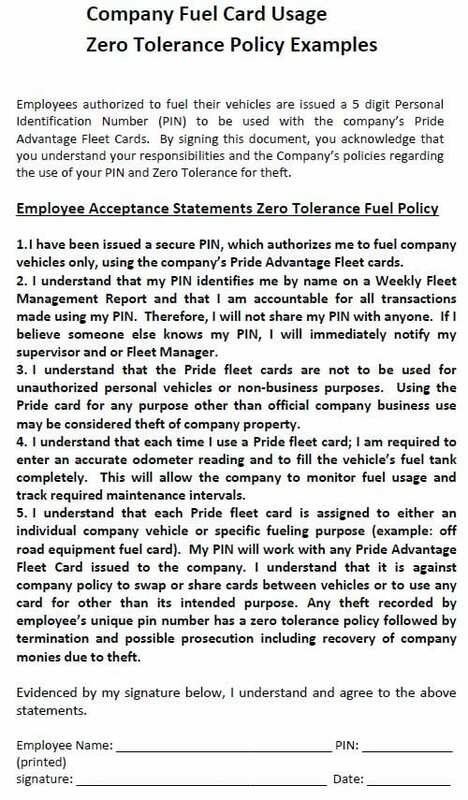 Policies vary but should generally include language that requires the use of a fleet card for fuel purchases, states that PIN use is tracked by employee, confirms that employees are held accountable for any wrongdoing associated with their PIN and acknowledges that fuel theft will lead to immediate termination. Use E-Receipts to reinforce your fuel policy. An E-Receipt is a real-time email showing who bought what fuel, when and where, as it happens. Make sure this E-Receipt is going to several levels in your office, where employees are paying attention to what your drivers are doing. If your fleet knows that their fuel purchases are completely transparent, they will think twice before doing something convenient for themselves over what the company needs. When a driver buys the wrong product, or was getting fuel out of route, you can follow up immediately to reinforce your fuel policies without waiting for a bill to show up at the end of the month. Star Oilco can limit your fuel cards to work only during your business hours and/or within your territory. Whether your territory is an entire state or limited to specific zip codes, you can define where your fleet can get fuel and where they cannot. And to avoid late night or early morning fuel theft, consider disabling your fuel cards during specified periods of the day or week, so that your cards don’t work when you don’t want them being used. This can easily be done as you need it by either contacting Star Oilco and asking us to do it for you, or by logging into your online Pacific Pride / CFN portal to set these restrictions yourself. Set up your cards to only allow for a certain quantity or specific grade of fuel. Consider limiting the volume of fuel purchased to match the size of a vehicle’s tank. Also, limit the number of transactions per day as well. That way, if for some reason that card gets stolen and someone has a working PIN, their theft is thoroughly limited. Ask your vendor to review of all the cards and PINs you’ve used throughout the year. Star Oilco seeks to do this annually. As per the state of Oregon (where Star Oilco is located), we receive a Fire Marshall audit every year and as they audit our cardlock records, we do the same and review every card and PIN for that year. You should do this too and Star Oilco can help. We recommend turning off all cards that are not being regularly used, which also allows you to adjust other details as needed.